There is nothing more fun than to be on the scenic Schuylkill River with a group of your best friends spending the day paddling on a hot summers afternoon, splashing and spraying each other as you drift down the river soaking up the suns rays and taking in all that mother nature has to offer. Watch along the rivers banks for deer, egret, herons and yes a beaver or two. On occasions there have been eagle sightings where the Perkiomen flows into the Schuylkill. 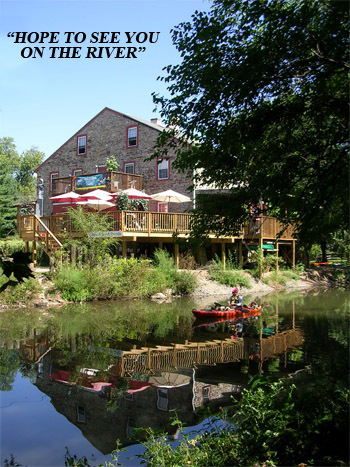 When you get back from your river excursion stop in at the "Fitz" and enjoy a sandwich and an ice cold beer while you and your seaworthy friends discuss the great times you had on the river today. We're open seven days a week so stop back as often as you can and bring the whole family next time. ▪ Beginners should take a shorter trip their first time out. ▪ You should always wear footwear and bring a dry change of clothing. ▪ Bring along a thirst quenching drink (no large coolers). ▪ Carry food and belongings in a watertight container secured to your craft. ▪ Be courteous to others along the waterway. ▪ Protect yourself from the sun & use straps for glasses. ▪ Never use drugs or alcoholic beverages on the waterway. ▪ Respect the neighbors, stay off private property. ▪ Wear your life jacket at all times.